The very attractive, non-branching Cabbage Coral is easy to care for and comes in a variety of attractive colors! The Cabbage Coral Montipora foliosa is a plate Montipora. It typically grows in colonies of thin plates without upright branches forming on the surface. But it does have rows of ridges run perpendicular to the edge, or margin of the coral, which is a good identifying characteristic. It is described by various common names including Scrolling Montipora Coral, Porous Lettuce Coral, Plated Coral, and Pore Coral. In its natural colors the Cabbage Coral can be pink, green, brown, cream, blue, lavender or gray. The polyps are typically contrasting in color to the main fleshy part of the coral, typically white or shades of blues and purples. Some also have a contrasting edge or margin color, in a pale cream pink or purple. Captive varieties can have even more color variation due to cultivators bringing out these desirable hues. It's a very attractive small polyp stony (SPS) coral that makes a great showpiece in a reef tank. The M. foliosa is a fast growing Montipora and it has been bred in captivity. They're easy to moderate to care for, accepting a wide range of lighting. They are less likely to bleach or get the diseases that the Acropora corals tend to get, but it needs a roomy tank in which to expand. Keeping this coral trimmed back is necessary, yet this can be positive thing. Selling the pieces to other aquarists helps to preserve the wild population. These Montipora can be quite dominating in a tank, yet their beauty makes it easy for one to make allowances for the rapid growth of connecting plates. Montipora Coral Information: The Cabbage Coral Montipora foliosa was described by Pallas in 1766. Some common names they are known for are Scrolling Montipora Coral, Porous Lettuce Coral, Plated Coral, and Pore Coral. Where Montipora Corals Are Found: M. foliosa are found in the waters of Australia in the Great Barrier Reef, Coral Sea, and Houtman Abrolhos Islands. They are also found from the Red Sea to New Hebrides and then to Fiji. Montipora Coral Habitat: M. foliosa are generally found on protected upper reef slopes and shallow warm waters, such as lagoons, at depth that ranges from 0 to 9 feet (0 - 3 m). The water movement within their habitat is usually calm yet turbulent, a nonlinear water movement. At times, entire reefs can be made up of just this particular Montipora species, thus underscoring the need for a larger tank in captivity. The Montipora foliosa is not on the IUCN Red List for Endangered Species. What do Montipora Corals look like: The Montipora Spp. corals have very porous and lightweight skeletons. The Montipora foliosa are a plating species of small polyp stony (SPS) corals. It grows in colonies of thin plates without upright branches forming on the surface. The corallites grow between the many thin and short spaced walls or reticulum. These rows of ridges run perpendicular to the edge, or margin of the coral, which is a good identifying characteristic. The colors the Cabbage Coral come in pink, green, brown, cream, blue, lavender or gray. The polyps are typically contrasting in color to the main fleshy part of the coral. These polyps can be white, turquoise, dark pink, dark blue, or purple. The margins or edges of the M. foliosa can be a contrasting pale cream pink or purple. Captive varieties can have even more color variation due to cultivators bringing out these desirable hues. Montipora Coral Care: The M. foliosa is easy to moderate to care for, accepting a wide range of lighting. They must be placed so they have room to grow because, under the right lighting, they are a fast-growing species. Unlike Acropora, which are in the same family, Montipora corals do not stress as easily and are more resistant to bleaching and disease. Some credit this resistance to their deep-set polyps.They are easy to propagate as well. Wild caught specimens do not do as well in captivity as aquacultured ones. Montipora Coral Feeding: In the wild, Montipora corals have developed several feeding strategies. Through a symbiotic relationship with a marine algae, known as zooxanthellae, they receive the majority of their nutrients. They also capture planktonic organisms and microscopic food particles from the water column and can absorb dissolved organic matter. Pristine tank conditions are needed to keep all Montipora spp. corals. Doing water changes of 10% every 2 weeks is needed, although it is suggested that doing 5% water changes once a week will bring about amazing results. Keep the nitrate levels low. Maintaining calcium and alkalinity levels are important. A well-feed live rock/reef environment is what is needed for your Cabbage Coral, along with some fish for organic matter production. These corals are usually hardy and fast-growing, however a mature tank is recommended. For tanks with metal halides, position your Monti in the mid levels. With other lighting, position your Monti at the upper to mid levels depending on the watts used. Your Monti will show whether it is happy or not by the coloring. Do not keep lights on for more than 7 hours, or the risk of developing algae on the M. foliosa will become greater. Make sure that no other corals or even algae can come in contact with your Montipora. Monti's are mild mannered and will end up loosing any chemical warfare. Montipora are not aggressive corals, nor do they posses strong defenses. Because of this, they must be placed away from any aggressive or defensive coral. Although not as touchy as Acroporas, the Montipora genus should still do best kept in a small polyp stony (SPS) tank. It will tolerate a mixed coral tank better than Acros, but plenty of room should be around your Montipora, even distancing it from another Montipora species. Oddly, colors can at times determine hierarchy in a tank. For instance, a brown Montipora digitata will usually loose to attacks by their colored up sisters and brothers. The Montipora Sp. are male and female and can reproduce both sexually and asexually. In the wild they reproduce sexually by releasing eggs and sperm at the same time, resulting in a fertilized egg which then forms into a free-swimming planula larva. Eventually the planula larvae settles onto the substrate, becoming plankters. This then forms a tiny polyp which begins to excrete calcium carbonate and develops into a coral. Planula larvae are extremely vulnerable to predation, and very few survive. Montiporas reproduce asexually as well. In the wild Montiporas spread from breakage due to storms and fragmentation. The Montipora spp. are generally disease resistant, but can still get the same illnesses that any other small polyp stony (SPS) coral can get under poor conditions. An ailment on some Montipora's are tumor like growths, but these tumors are not harmful, just ugly. Caution is recommended if you plan to add Limpet snails to your tank as they have been known to eat Montipora corals (as well as Acropora). Magilopsis (a gastropod) and Prosthiostomum (a flatworm) are common Montipora pests. In general, if your M. foliosa has any kind of tissue recession, just cut off the healthy part. Just make sure you cut into some of the healthy part also, to be sure there is no disease encroaching on the healthy tissue. Also, keep out the cyanobacteria and algae with good water movement, and your Monti will stay happy. 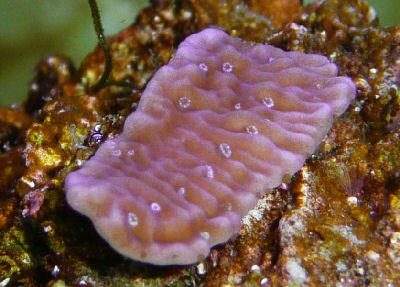 Montipora Corals for Sale: The Cabbage Coral M. foliosa is moderately easy to find at pet shops and on line. Online they can run about $79.00 USD or more depending on size. Many reef clubs have these corals and can they can also be obtained for a fair price from an aquarist who may have this coral. Blane Perun, Montipora Foliosa, Blane Perun's TheSea.org, Copyright 1999.